Great Britain's Tao Geoghegan Hart will make his Grand Tour debut when he rides for Team Sky at the Vuelta a Espana. He is part of an eight-man squad for the event, which starts on 25 August. 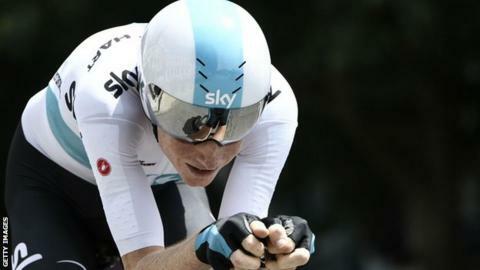 Last year's Vuelta winner Chris Froome and 2018 Tour de France champion Geraint Thomas are not competing as they are in the Tour of Britain. "I've been building towards this since I first started with Team Sky, and in many ways for years prior to turning professional," said Geoghegan Hart, 23. "I'm really looking forward to doing the lap of Spain with such a strong squad, and trying to learn as much as I can." Russia's Pavel Sivakov is also making his Grand Tour debut for Team Sky, and the rest of the squad includes Poland's Michal Kwiatkowski, Spain's David de la Cruz and Jonathan Castroviejo, Colombia's Sergio Henao, Italy's Salvatore Puccio, and Dylan van Baarle of the Netherlands. Geoghegan Hart, from London, came eighth overall in last year's Tour de Yorkshire and fifth overall in both the Tour of California and the Vuelta a Burgos earlier this year. "Our line-up has a real mix of youth and experience," said Sky's team principal Sir Dave Brailsford. "In Tao Geoghegan Hart and Pavel Sivakov, we have two young riders who I'm convinced will experience success in Grand Tours in the future. "Their willingness to make the sacrifices necessary to succeed, commitment to hard work, and most importantly their desire to learn, have been exemplary and I couldn't be more proud of them." The Vuelta a Espana begins in Malaga, consists of 21 stages and finishes in Madrid on 16 September.